Bob Northam has kidney disease. He survived many years functioning with a kidney donated by his loving mother, but that organ eventually failed. Because of this, he has been on dialysis for seven years, driving to a dialysis facility near his home and waiting three or four hours, sometimes more, while a medical—perhaps a better word is “magical”—device removes the waste products and impurities and poisons from his bloodstream. Northam has traveled this path gracefully, gratefully, and mostly in good humor. 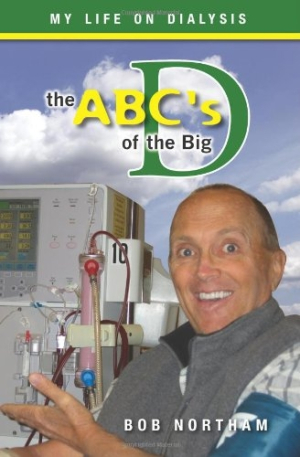 With The ABC’s of the Big D, he has written a short, how-to guide for a prospective patient or for someone close to a person who must undergo dialysis. Northam includes information about the procedure that many dialysis patients might not want to share, might not know how to share, or might not realize they should share. Despite his ample notes on all the good things he’s missed while on dialysis—think beer, which is high in phosphorous—Northam offers no solid tips on how to find food that is appealing but not forbidden or restricted while on dialysis. Rather than simply stating that dialysis patients are counseled by dietitians, readers would likely have found it helpful to hear from Northam himself about his own diet. The author also does not include footnotes, a bibliography, or an index, which would have been helpful resources. Even though some of the book can be technical, Northam’s down-to-earth advice, in colloquial and readable prose, shines. Statements like “for the most part you always feel like crap,” or “dialysis brings on a sense of restlessness and, yes, irritability that … does add to our grumpiness quotient,” or “it might take extra initiative to force yourself to become more active socially” may seem overly negative to some readers. Fortunately, Northam writes with humor and intelligence and stresses the two factors that will allow a person to cope with dialysis: compliance with medical necessities, and, most of all, a positive attitude. Northam offers a short, readable, and sufficiently detailed book that will be of solid value to a person facing dialysis or to someone who has a family member or friend undertaking that journey.